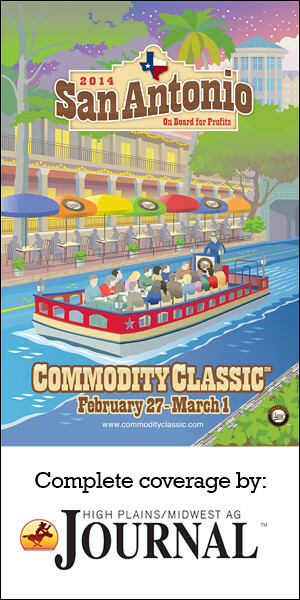 Commodity Classic is an opportunity for growers to connect with innovation, enhance their knowledge on their crops, as well as offer their voice on policy decisions that will affect their bottom lines. The Wheat Industry Booth at the 2013 Commodity Classic in Kissimmee, Fla., offered attendees promotional information about wheat’s role in our daily lives as well as a chance to give their voice to legislators about the need for a farm bill. The National Association of Wheat Growers (NAWG), U.S. Wheat Associates (USW) and the Wheat Foods Council (WFC) offered visitors the chance to spin a prize wheel and answer questions about the “staff of life” and to enter for a chance to win a ruggedized digital camera. The booth also offered an opportunity for farmers to write to their member of Congress on the postcards provided. Officials from NAWG will deliver those postcards to Representatives and Senators following the conclusion of Commodity Classic. “We are always encouraging farmers to be more involved in the decisions made at a national level that will affect their businesses and their communities,” said Bing Von Bergen, who was elected NAWG president at the board meeting earlier in the week.